Depending upon its behaviour towards soap solution w.r.t. lather formation, water may be classified as : soft water and hard water. Soft water: Water that produces lather with soap readily is called soft water. For ex: Rain water ,distilled water ,demineralised water. Hard water: Water which does not produce lather with soap readily is called hard water. For ex: sea water ,river water, spring water ,lake water and well water. Hardness of water is due to the presence of bicarbonate ,chloride and sulphate of calcium and magnesium in it. Hard water does not produce lather with soap readily. Soap is sodium or potassium salt of certain higher fatty acids such as steric acid, palmitic acid ,oleic acid. when hard water is treated with soap solution, Ca2+ and Mg2+ ions present in hard water react with the anions of fatty acids present in soap to form scum or curdy white precipitate. As a result, hard water does not produce lather with soap immediately. 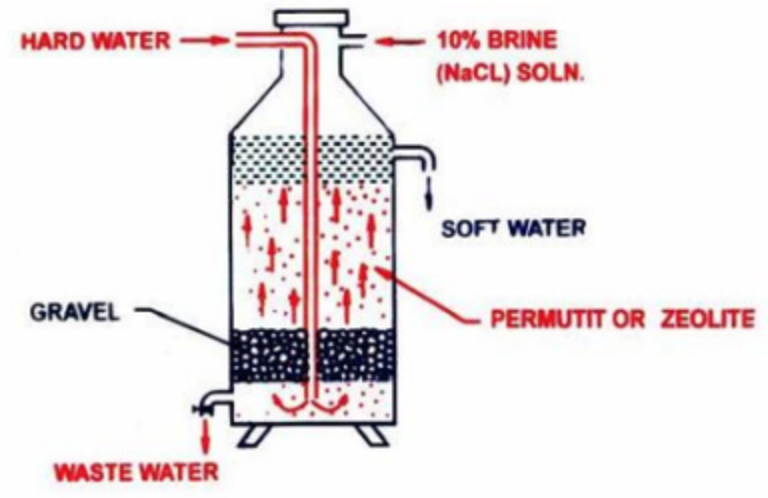 When all the Ca2+ and Mg2+ ions present in hard water have been precipitated by addition of sufficient amount of soap, the resulting water becomes soft and thus readily produces lather with soap. Hard water is not suitable for washing purpose since lot of soap is wasted in precipitating out Ca2+ and Mg2+ ions present in hard water. 1) Temporary hardness : Temporary hardness of water is due to the presence of bicarbonates of calcium and magnesium, i.e. Ca(HCO3)2 and Mg(HCO3)2 .It is called temporary hardness since it can be easily removed by boiling and filtering the water. Temporary hardness is also called carbonate hardness. 2) Permanent hardness: Permanent hardness of water is due to presence of soluble chlorides and sulphates of calcium and magnesium, i.e. CaCl2 , CaSO4 , MgCl2 , MgSO4. This type of hardness is called permanent hardness since it cannot be removed simply by boiling the water. Permanent hardness is also called non-carbonate hardness. The process of removing hardness i.e. soluble bicarbonate, chloride and sulphate of calcium and magnesium from hard water is called softening of water. a) By boiling: When temporary hard water is boiled, bicarbonates of calcium and magnesium decompose to form insoluble calcium and magnesium carbonate. These insoluble carbonates are removed by filtration and the water is rendered soft. b) By clark’s process: In this process ,calculated quantity of quicklime is added. The bicarbonates present in the temporary hard water reacts with lime to form insoluble calcium and magnesium carbonate which can be easily filtered off. If excess of lime is added water will again become hard due to absorption of carbon dioxide from the atmosphere by unused slaked lime to form soluble calcium bicarbonate. a) Washing soda process: Hard water is treated with a calculated amount of washing soda .When Chloride and sulphate of calcium and magnesium present in hard water get precipitated as insoluble calcium and magnesium carbonate which can be easily filtered off. The water thus becomes soft. a) lime – soda process: This method is employed for the softening of hard water which contains both temporary and permanent hardness. Calculated quantities of slaked lime and sodium carbonate are used. Whereas slaked lime removes temporary hardness ,sodium carbonate remove permanent hardness. b) Ion-exchange method: The Ca2+ and Mg2+ ions present in hard water are exchanged by those present in complex inorganic and organic compounds called ion exchangers. Complex inorganic salts like hydrated sodium aluminium silicate, Na2Al2Si2O8·x H2O have the interesting property of exchanging Ca2+ and Mg2+ ions present in hard water with sodium present in complex salts. The naturally occurring complex salts are called zeolite. These may also be prepared artificially by fusing strongly a mixture of washing soda, alumina(Al2O3) and silica(SiO2). The fused mass is washed with water to remove soluble impurities and the porous mass thus obtained is called permutit. Both permutit and zeolite can be represented by the general formula Na2Z where Z= Al2Si2O8·x H2O . The permutit and zeolite is loosely packed over layers of gravel and sand in a big tank. Hard water is introduced from the top into the base of the tank. From the bottom ,water rises up through the gravel and sand layers and finally circulates through the bed of the permutit. During the process,Ca2+ and Mg2+ ions are exchanged by sodium ions in the permutit. Ca2+ and Mg2+ ions get attached to the zeolite and the water which rises above the permutit layer is reasonably soft. The softened water still contains sodium salts. But these sodium salt do not precipitate soap and hence do not prevent the lather formation. After sometime, the whole of permutit get exhausted due to the conversion of sodium zeolite into calcium and magnesium zeolite. It can however be, regenerated by passing a 10% solution of NaCl through it. The soluble calcium and magnesium salt thus formed are washed away by water and the regenerated permutit. can be used again. 1) It is an efficient process. 2) This is very cheap process since during the process only sodium chloride is consumed which is quite cheap. 3) It can be used to remove both temporary and permanent hardness completely. 2) Organic Ion exchangers: Certain synthetic organic exchangers also called ion exchange resins are even superior to zeolites since they can remove all types of cations and anions present in hard water. The resulting water is called demineralised water or deionized water and is as good as distilled water. a) Cation exchange resins : These resins consists of giant hydrocarbons framework attached to acidic groups such as -COOH or -SO2OH groups.They may be represented by general formula R–COOH and R–SO2OH where R represents the giant hydrocarbons framework. Since these raisins can exchange H+ ions with cations such as Ca2+ and Mg2+ ions present in hard water, they are called cation exchange resins or simply cation exchanges. b) Anion exchange resins :These resins consist of giant hydrocarbon framework attached to basic groups such as OH‾ ions usually in form of substituted ammonium hydroxide. The general formula R-NH3OH where R denotes the giant hydrocarbon framework.Since these reasons can exchange OH‾ ions with anions such as Cl‾ and SO42‾ ions present in hard water, they are called an anion exchange resins or or anion exchanger. The water which comes out from the bottom of the first tank is richer in H+ ions.This water is then passed through a second tank which is packed with anion exchange resins supported over gravel.Hence the Cl‾ and SO42‾ ions present in hard water exchange with OH‾ ions of the resins. The H+ ions coming from the first tank combine with OH‾ ions liberated in the second tank to form water. The water obtained by this method is free from all types of cations as well as anions.Therefore this method is particularly useful in obtaining drinking water from sea water and also for obtaining pure water for laboratory purposes. The exhausted resin in the first rank is regenerated by treatment with moderately concentrated H2SO4 or HCl. The exhausted resin in the second time is regenerated by treatment with moderately strong NaOH solution. The cation and anion exchanger can be used over again and again. It makes this process both efficient and cheap. 3) Calgon process: Ca2+ and Mg2+ ions present in hard water are rendered ineffective by treatment with sodium poly metaphosphate (NaPO3)x where x is as high as 100 ,or more commonly with sodium hexametaphosphate, Na2[Na4(PO3)6]. Sodium hexametaphosphate is also called as calgon. When calgon is added to hard water the Ca2+ and Mg2+ ions present in it combine with sodium hexametaphosphate to form soluble complex of calcium and magnesium salts. The complex calcium and magnesium ions do not form any precipitate with soap and hence readily produce lather with soap solution. The water softened by the above process can be used for laundry and household washing purposes and also for raising steam in boilers. calgon is also in synthetic detergents to check the wastage of soap during washing of clothes and also for removing boiler scales. Amazing notes. Really appreciatable and helpful.